Core Sans M is a 56 fonts family created by Hyun-Seung Lee, Dae-Hoon Hahm and Min-Joo Ham and published through S-Core. As part of the Core Sans Series, such as Core Sans N and Core Sans N SC, Core Sans M comes with rounded finish, soft and friendly appearance that make it very good for use in books, print, web apps, screen display etc. 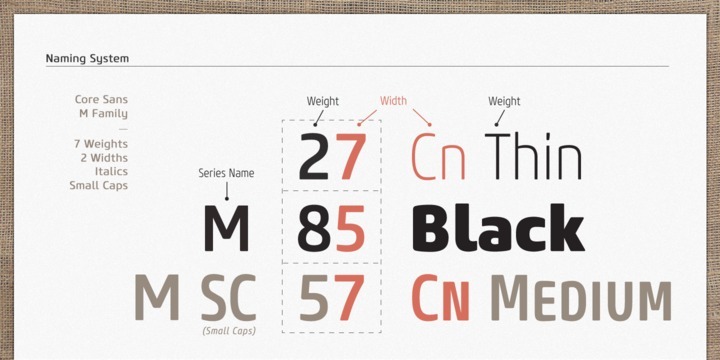 A font description published on Friday, May 24th, 2013 in Fonts, S-Core by Andrei that has 8,749 views.